The trail by candlelight. Photo by Bev Johnson. This event began years ago as a Candlelight Ski event, but due to lack of snow, it’s morphed into a hike. Watch the weather though—this year COULD be different! The event is set for Saturday, February 2,2019 from 5:30 p.m. to 8 p.m. 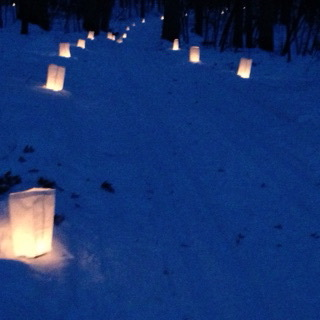 Approximately one-mile of trail through the Lake Maria forest will be lit by candle luminaries. The trail begins and ends at the heated trail center building. You may walk the trail or use snowshoes. There will also be a supervised bonfire along the trail at the halfway point, and we’ll be making s’mores for hikers. If weather brings the windchill below -20F, the hike will be canceled. Fingers crossed there is beautiful weather!